This entry was posted in Racing on January 3, 2011 by Steve Tilford. I’ve been packing all morning to head down to Austin. I drank a bit too much red wine, while catching up with Sara, last night, so I’m a little foggy this morning. I’m sure I’ll figure out something to say as the day gets clearer and the drive gets longer. Bromont isn't looking to happy as a play companion. A very cute dog. 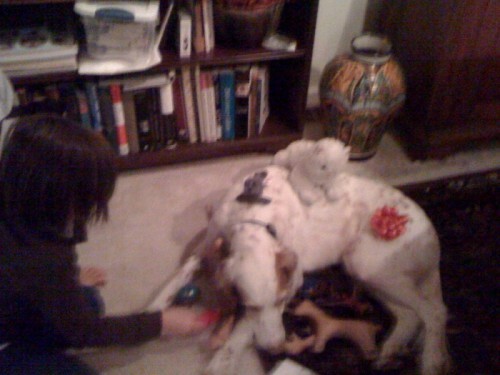 All the more cute because he’s just tolerating being dressed with bows—not quite his idea of proper hunting attire.